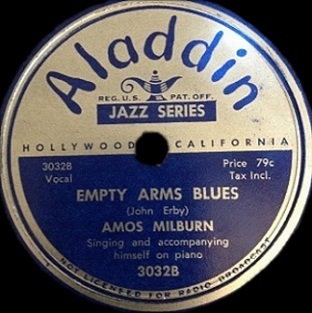 One of the side criticisms of Amos Milburn’s – and more pertinently his record company Aladdin’s – decision to revisit earlier hit songs in all but name is how unnecessary it was. Of all of rock’s earliest stars Milburn was the one who was known for his diversity and so the decision to largely confine his releases following his late 1948 commercial breakthrough to efforts made specifically to remind listeners of those recent hits was counterproductive. Maybe not in terms of appeal, as the top side of this record proved as hit #1 in short order, but certainly in regards to presenting him as a versatile artist for whom each record would be a must-buy in the future just to hear what new idea he was laying down. But by NOT laying down new ideas, or rejecting the new ideas he did have in order to present song ideas that were already old hat, you were potentially curtailing interest in his continued artistic development. What makes this even more alarming is that Amos Milburn was so creative from the very start that by mid-1949 his two year old work was still fresh enough, original enough and enjoyable enough to be hits in a landscape that had radically changed since those songs were recorded. This is just such a song. Here’s an interesting thing to note about Amos Milburn’s recent hit output. Of the eight songs of his that reached the Billboard charts thus far, including both sides of this record, five of them had been recorded in November and December 1947. It’s August 1949 now as this is released and while two years might not seem like a very long time keep in mind that rock ‘n’ roll music itself had only just emerged from the womb in the fall of 1947 and hadn’t yet developed all of its most recognizable features. The biggest songs from that period, had they been held back and released in the summer of ’49, probably wouldn’t have been nearly as well received because time has a way of dating things. Except for Amos Milburn that is. His songs cut in the waning days of 1947 haven’t seemed to age a bit by this point even though it’s pretty certain that the motive behind Aladdin Records releasing these now was simply to empty their vaults since most of these older records were pegged as B-sides and thus weren’t seen as being quite strong enough to be the plug side. It also meant he wouldn’t have to keep writing and recording an endless stream of new tunes to keep up with the label’s release schedule, saving them time, money and keeping Milburn from stretching himself too thin. But in doing so the inadvertent revelation in exhuming this older material was showing just how visionary Amos Milburn had been all along. But that’s also why the decision to have him keep recycling one particularly winning concept when he DID enter the studio now was all the more baffling. If the sides he cut two years ago were still modern sounding enough to score with today’s audiences, then wouldn’t it stand to reason that allowing him to keep trying out new approaches once rock had fully coalesced and had a track record of what worked, much of which he himself had come up with originally, might lead to MORE innovations that would be commercially appealing not to mention be influential for shaping the sounds of the future? You’d think so… unless you were in charge of a record company who seemed to view the entire endeavor of putting out music to be an utter crap shoot. Then of course it made perfect sense to go back to the same creative well until it was completely dry. But all that shows is Milburn’s most creative sides being issued today are yesterday’s leftovers and in Empty Arms Blues he’s serving up another song which is perfectly qualified to stand amongst the newest sides from the rest of the rock universe. Now before anyone gets the wrong idea, had this song come out at the tail end of 1947 it wasn’t going to set any hot new trends or change the course of rock music. Even limiting the discussion to simply rock ballads of the era Empty Arms Blues was an agreeable entry but it wasn’t ahead of its time so much as it was simply not rigidly confined to its time. Still, we get certain clues as to its vintage when comparing it to what came later in a similar vein when the arrangements were beefed up, so this provides a good way to track their progress in many ways. For starters Milburn’s piano is more prominently featured than on a lot of his later records, particularly the slower numbers over the past year, which gives this a slightly rawer sound than we’re used to when Maxwell Davis began adding more textures to the arrangements after this. Davis himself is on here of course but his smoky sax takes a back seat to Milburn who flashes his nimble fingers throughout, his left hammering out a choppy rhythm while his right traverses the keys with the restless curiosity of an explorer. The music’s jittery pacing provides an unusual, but well-judged, contrast to the lyrics and to Milburn’s overall despondent mood. It’s really too spry for a ballad but nowhere near energetic enough to match up well with his uptempo performances and so as it vacillates between the two its ultimate placement will probably rest with each individual listener whose own outlooks and sentiments at the time of hearing the song will tilt the view of it in one direction or another. The lyrics are also contributing to this impression as Amos’s recollections bounce between his dejected feelings of losing this girl to the joy he’d felt when they first got together. Like so many inward looking ruminations in these circumstances when someone’s ability to focus strictly on one perspective becomes too much to bear, thus resulting in jumping from one extreme to another as a coping mechanism, Milburn exhibits these same qualities, not just in what he’s saying but also in how he’s singing it. Downhearted for much of it he nevertheless cries out with unbridled intensity at various points within, venting his grief as well as trying to reclaim some of his dignity with statements suggesting the girl in question will soon be grappling with the same afflictions without him as he’s now enduring after losing her. It’s an effective tactic that pulls the listener in a little deeper, as you tend to react viscerally to his emotions more than you might by simply responding intellectually to his statements within. Always an underrated pure vocalist because he didn’t have the dynamic range or power of many of his competitors, he made up for it by how he shaded his deliveries and this is no exception. In many ways this is a Milburn prototype that had already been fleshed out countless times in months since it was recorded… songs the public had heard and embraced over the past year. It’s a stripped down sound from what we’d come to know. With its cruder accompaniment and a story that hits on all of the pertinent topics without actually peeling back more layers to reveal what’s going on behind the doors this is essentially a dry run through of something he’d perfect in short order. That it still works well enough when heard in mid-1949 – and audiences clearly agreed, sending this to #4 on the Billboard charts – shows that his skill set was in place from the very start. It also must’ve been something of an ego boost for Milburn, a validation as to his talents, as Empty Arms Blues wasn’t scoring because of exquisite timing for what it contained as so many records had, but rather it was popular in spite of its timing. Out of date in terms of what factors went into it upon the song’s creation if nothing else. Usually of course hit records hadn’t sat collecting dust on a shelf for twenty-one months and so this is unique in that sense as well. Putting aside re-mixes and re-issues, or album tracks given new life as singles, there’s not too much to compare this phenomenon to. Fats Domino’s Blue Monday charted 21 months after it was recorded as well, so this isn’t not alone in that regard, but it is exceedingly rare all the same. Considering the circumstances Empty Arms Blues a welcome addition to the Milburn canon, a hit record that further cemented his stature a top the rock world in 1949, but probably not among his essential recordings. Still there’s something to be said for an artist in the singles era who was still able to draw plenty of interest and acclaim for something which pre-dated most of the sounds currently setting the world afire. Amos Milburn’s greatest asset arguably was his consistency, the ability to deliver stellar performances that stood the test of time without necessarily always standing out. Of course historically speaking that may have also been his greatest detriment when it came to being seen as defining any one time. Irony is thy name Amos Milburn. Leave a reply on "Amos Milburn: “Empty Arms Blues”"